Little did I know that when I accepted the invitation to participate in theYouthBuild USA sponsorship launch in Worcester, Massachusetts that I would actually be put to work! 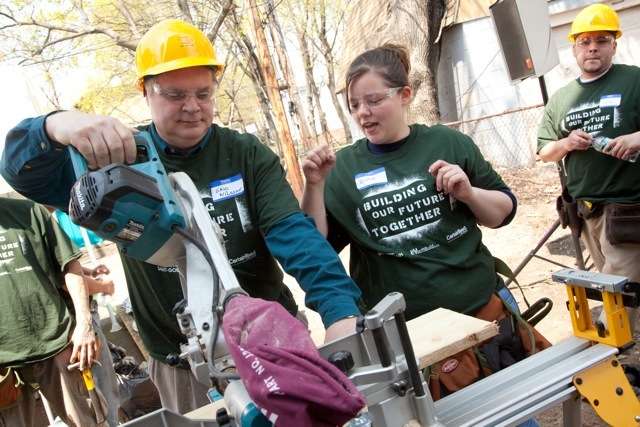 My first professional job when I finished college was in Worcester and it was nice to return, especially to take part in an event bringing student skills training and neighborhood rebuilding together. CertainTeed’s parent company Saint-Gobain recently launched a three-year partnership to support YouthBuild USA projects in Philadelphia, PA; Worcester, MA; Schenectady, NY and Akron, OH. The sponsorship is not just financial but includes product donations, technical expertise and training. While it is always nice to be part of a check presentation supporting an organization providing valuable service and training to youth, this particular event brought in a new and personally gratifying dimension for me – the opportunity to work along side the teachers and the students from YouthBuild. I was assigned to a team installing a CertainTeed Evernew® deck and railing on the back portion of the building. Other groups were working on installing CertaWrap™ house wrap and our Weatherboards™ fiber cement siding product. I don’t usually have the opportunity to get ‘hands on’ with building materials and had forgotten how important math skills and teamwork are in the building trades. The YouthBuild teacher would ask the students questions about the measurements and checking on the accuracy before cutting product. It was obvious this had recently been part of the classroom instruction for these apprentices. I also realized that what makes YouthBuild special is that not just the teaching of building skills but the development of life skills that these students experience by showing up every day. For example, the importance of listening to the instructor or foreman on a worksite, the attention to detail, applying knowledge learned, working well with others, the commitment to completing the job, and the pride in seeing the finished product. We should all be reminded of the value in an honest day’s work. I could see it in the accomplishments of these students in Worcester. I’d really like to be a part of community where I can get feed-back from other knowledgeable people that share the same interest. If you have any suggestions, please let me know. Thanks!